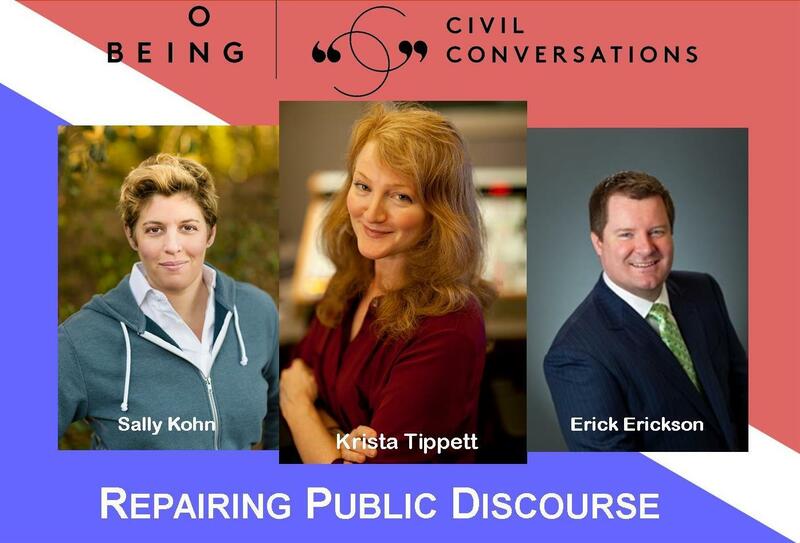 Sally Kohn, Krista Tippett, Erick Erickson. "Political modes of argument and debate have infiltrated all of our spheres," says "On Being" host Krista Tippett. "The way we take up any important subject, even in a community, even in a religious institution, it's very contentious. It's about turning issues into a debate between this extreme and that extreme, it's about competing answers. It's not about what are the questions before us that we all have a stake in. There are some simple things that we can do that are actually very hard because they feel so counter-intuitive because of the set of instincts and reflexes that we've worked up." Krista Tippett joins us to talk about politics and civility and the upcoming "Repairing Public Discourse" event in Missoula Tuesday night. Tippett is a Peabody-award winning broadcaster, National Humanities Medalist, and New York Times bestselling author. She founded and leads The On Being Project, hosts the globally esteemed "On Being" public radio show and podcast, and curates the Civil Conversations Project, an emergent approach to conversation and relationship across the differences of our age. This special event will be about 90 minutes long and there will be time for audience Q & A, so bring your best questions. The conversation will be recorded, and if all goes well it may be edited for an episode of "On Being" or included in the Civil Conversations website archive.